Retinopathy of Prematurity (ROP), originally called retrolental fibroplasia, was the leading cause of blindness in children in the 1940s and 1950s. It was first described in the medical literature in 1942 by Terry. In 1952, Campbell theorized that the condition was caused by the use of oxygen therapy to treat the immature lungs in premature infants. Today, we realize that oxygen is not the only factor in developing ROP. High levels of oxygen have been associated with ROP, but lower levels of oxygen may lead to more respiratory complications and death in premature infants. Better oxygen level monitoring has led to better control of the oxygen given to premature infants. Today, however, there is an increase in ROP due to the fact that neonatal care advances mean more low weight premature infants are surviving. ROP occurs in over 16% of all premature births. In babies weighing less than 1,700 grams at birth, over 50% will develop ROP. In the United States , over 2,100 children annually experience the complications of ROP. Of those estimates of 500 to 1,200 cases of new blindness or severe complications are reported. Studies have found that about 30% of infants with advanced ROP have 20/200 or less in their better eye. From 16 weeks to birth, retinal blood vessels grow out from the optic nerve to reach the peripheral retina. The last twelve weeks of a normal 40 week gestation are crucial in the development of fetal eyes. In premature infants, the normal growth of blood vessels stops. It is theorized that the area without adequate blood supply emits a chemical trigger to stimulate growth of the abnormal vessels. These vessels lead to a formation of a ring of scare tis sue attached to both the retina and the vitreous gel that fills the center of our eyes. As the scar contracts, it may pull on the retinal creating a retinal detachment. Regardless of the gestation age at birth, ROP seems to occur at about 37 to 40 weeks. Our understanding of ROP is changing. Traditionally the view was that high oxygen exposure was the cause. While it is certainly one of the major factors, studies now show that it is not just exposure to oxygen or other toxic agents after birth, but may also relate to actions that occur to the fetus prior to birth. Both chronic hypoxia (lack of oxygen) and intrauterine growth retardation may relate to ROP development. As many as one third of ROP cases may be the result of prenatal conditions. Light exposure has been suggested as another factor. To date, scientific studies have not confirmed light as a cause. Infants born at 23-24 weeks should be examined within three to four weeks. Infants born at or beyond 25 to 28 weeks should be examined by the fourth to fifth week. Infants born after 29 weeks should be examined prior to discharge from the hospital. All premature children are at a higher risk for other eye and vision complications. Thus, eye examinations every six months are recommended for all infants born under 32 weeks or that weigh less than 1500 grams. Twenty percent of these premature infants without ROP will still develop a crossing or turning out of the eyes and significant refractive problems requiring prescription eyeglasses. Doctors classify ROP by ana tom ical zones, clock dial like location within the eye and stages of severity. Zone 1 is the center of the retina while zone 3 is the far peripheral retina. In 1984, an international classification system was developed. Stage 0 is the mildest form of ROP while Stage 5 is the most severe indicating total retinal detachment. Doctors may also use the terms “popcorn” referring to a scarring that is regressing following abnormal vessel growth. The term, “hot dog”, may refer to a red hot ridge of increasing abnormal vessel grow. The retina may become stretched and pulled by the contraction of the scars in the eye. This may physically pull the macula, the most sensitive part of the retina, causing abnormal vision. It may also cause folds in the retina and lead to retinal detachment. The retina is the light sensitivity “film-like” portion of the eye. A retinal detachment occurs when this delicate tis sue is dislodged from the internal walls of the eye. Retinal detachment (RD) is common in patients with ROP. In many cases, it leads to profound vision loss. Early detection and treatment is crucial. In stage 5, the most severe form of ROP, retinal detachment surgery may not be attempted due to the poor prognosis versus risk of operating on a premature infant. Strabismus is another complication and it is the crossing in or turning out of an eye. This may occur from the loss of vision in one eye or be related to the large refractive differences between the eyes. This difference is called an anisometropia or antimetropia. For example, one eye may be 1 unit of myopia (nearsightedness) while the other eye is six units of nearsightedness. Due to the vision loss or the strabismus, there is a loss of depth perception. Amblyopia is another condition found in ROP patients. It is a loss of vision in one eye, because the brain does not use that eye to see. Ambylopia can occur from either the strabismus or the large difference in refractive error between the two eyes. Both cataract and corneal problems can develop. Severe damage may lead to Phthisis bulbi, a shrinking of the severely damaged eyes. Glaucoma may develop either early or as a later in life complication of ROP. Additionally, ROP patients may have high amounts of nearsightedness called myopia. In patients who experience significant vision loss, nystagmus, a rapid fluttering of the eyes, may occur. Nystagmus is common in all patients whose vision loss occurs at an early age. Up to 10% of all premature infants may develop glaucoma later in life. Sudden angle closure glaucoma has been found to occur in the 2nd or 3rd decade of life. Additionally, 20% of those without ROP will still develop strabismus (the crossing or turning out of the eyes) and significant refractive problems requiring prescription eyeglasses. Additionally, approximately 3% of ROP patients will develop retinal detachments later on in life. Patient’s eyes must be examined regularly throughout their life. To prevent ROP, good prenatal care is essential. This care lessens the risk of delivering premature infants. Next, careful monitoring of oxygen therapy and other risk factors are crucial to preventing ROP. In the hospital, monitoring by a retinal specialist skilled in ROP is essential in lessening the advancement of ROP. Cryotherapy or the freezing of the retinal tissue has been used since the 1970s to treat ROP. Today, laser therapy has been shown to be as effective as cryotherapy, but with less systemic side effects. Both therapies work by destroying a small part of the retina, thus reducing the need for oxygen and abnormal blood vessel growth. It may also thin the retina allowing more oxygen to diffuse into the retina. If a detachment of the retina occurs, scleral buckling may be required. It is a procedure that places a band around the globe of the eye. This brings the retina back into contact with the inner layers of the eye. A vitrec tom y is used to remove scar tis sue from within the eye in the more severe cases of ROP. During the vitrec tom y, the lens of the eye is usually removed as well. Due to the difficulty of performing these surgeries on the small eyes of premature infants, these surgeries are usually performed only by a small number of ophthalmologists with extensive experience in ROP. Low vision care is based on the degree of vision loss. It may be as simple as appropriate eyewear. Bifocals may be helpful from school age on. Also, the use of magnifiers and closed circuit television systems may be necessary to help ROP patients. The Jordy II has been helpful in patients with severe vision loss. In profound vision loss, Braille and other alternate mediums may be required. Electronic scanning or reading technologies have already opened many computer possibilities for even the totally blind. Unlike an adult low vision patient, a child’s visual system, eye, nerves and brain, are still developing. Parents need instruction on creating the best environment for their visually impaired child. Visual stimulation techniques, proper toys selection, creating proper contrast, alternate learning methods, parental narration and control of light and glare must be planned. In addition to other specialists, these children should be followed by the appropriate low vision professionals. As the child grows, educational needs must be assessed and the appropriate educational environment developed for each child. ROP patients frequently develop high amounts of myopia (nearsightedness) that require correction with eyeglasses. Bifocals and strong reading eyewear are often helpful. Contact lenses may be used in cases of severe anisometropia where the refractive powers of each eye are quite different. This often occurs if a vitrec tom y is performed and the lens of the eye is removed. This is particularly important in children to avoid the development of amblyopia. Since ROP patients frequently have one better eye, protection of the remaining functional eye is important. Patients who have only one functional eye should wear adequate protective eyewear fulltime. When possible, polycarbonate lenses are preferred due to their high impact resistance. 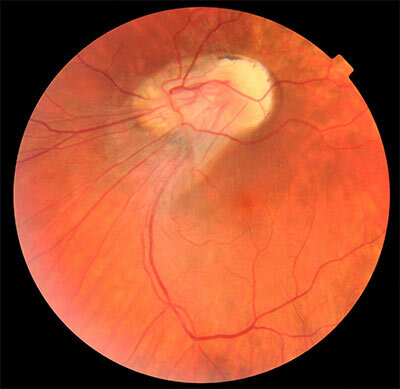 Additionally, physical education in school and other recreational activities must be limited to safe, non-traumatic activities due to increased risks for retinal detachment.